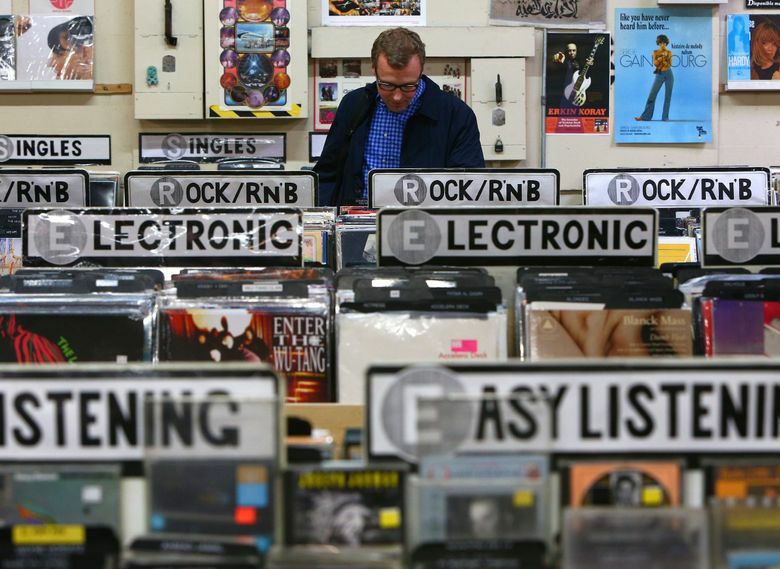 This Saturday, April 13, the annual vinyl-hunters holiday is upon us and Record Store Day 2019 is feeling particularly Seattle. Beyond RSD exclusive releases from local faves Benjamin Gibbard, Green River and Modest Mouse, Seattle rock heroes Pearl Jam have been tapped as this year’s official Record Store Day ambassadors, dropping the live recording from the band’s 2005 surprise show at Easy Street Records on vinyl. Whether or not you’re among the hard-core collectors braving early-morning lines for those RSD ‘sclusies, there are ample reasons to hit up your neighborhood record shop this Saturday. Here’s a guide to all the deals, live music and other RSD happenings around Seattle and Tacoma that we could find. Phinney Ridge’s vintage clothing/vinyl shop holds extended hours (9 a.m. to 9 p.m.) and plans to unearth some “harder to find” records for the occasion. Watch their Instagram for other coupons. 7200 Greenwood Ave. N., Seattle. The Fremont shop trades not in official RSD releases, instead dumping a stash of clean and rare LPs running the gamut from ’90s rap to metal and world music. Daybreak opens early at 9 a.m. 4308 Fremont Ave. N., Seattle. The West Seattle hot spot opens at the decidedly un-rock-‘n’-roll hour of 7 a.m., the alarm-clock misery softened with the promise of free bacon and Caffe Vita coffee to those early risers. Beyond the RSD releases, Easy Street hosts live music throughout the day, though at press time the lineup was yet to be announced. 4559 California Ave. S.W., Seattle. No deals this year, but the sprawling Capitol Hill store — opening early at 8 a.m. — is stacked with DJs and live acts performing throughout the day. Highlights include DoNormaal, Raica, experimental jazz duo Bad Luck, Wizdumb and Specswizard. 1520 10th Ave., Seattle. The Wallingford newcomer is stocking RSD titles aplenty this year and opening an hour early at 10 a.m. Singer-songwriter Barton Carrol performs at 3 p.m. 4515 Meridian Ave. N., Seattle. Easily the coolest RSD-related promo we’ve seen, the Georgetown shop is hosting record-cutting demos all day, giving patrons the chance to record and take home their own 7-inch on the spot. It’s not exactly a studio-grade recording setup, but your scraggly voice, wearied from a day spent bin sifting, could be immortalized on wax. 1201 S. Vale St., Seattle. In the record-peddling game since 1977, the Wallingford staple cuts 10 percent off vinyl and 20 percent off CDs in honor of RSD. 201 N.E. 45th St., Seattle. 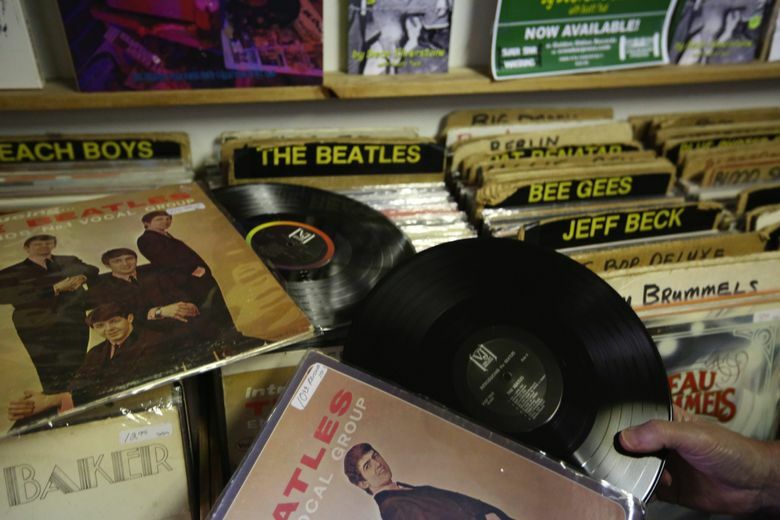 The discount party starts early at this Tacoma store, taking 20 percent off used records, CDs, cassettes and DVDs Friday through Sunday. On Saturday, Hi-Voltage opens an hour early at 9 a.m., with remaining RSD releases hitting its online store Sunday morning. 2714 Sixth Ave., Tacoma. The small/hip Pike Place Market shop will carry 100-plus RSD titles and give away store merch and other goodies. 1501 Pike Place, #325, Seattle. The label/shop’s storefront within the KEXP Gathering Space opens at 9 a.m., stocking 85-plus RSD releases and hosting Galaxie 500’s Damon Krukowski, who will sign copies of his “Ways of Hearing” book from 11 a.m. to noon. Sundae Crush performs 1-1:30 p.m. 472 First Ave. N., Seattle. The Ravenna shop knocks a cool 25 percent off the sticker price on used vinyl. 6504 Ravenna Ave. N.E., Seattle. Capitol Hill’s caffeine and vinyl purveyor will carry some RSD releases and promises a “big sale” on Porchlight titles and merch. 1517 14th Ave., Seattle. Beyond stocking the usual RSD releases, Rocket knocks 20 percent off all used music throughout the weekend. 3823 Sixth Ave., Tacoma. In addition to the RSD titles, the Belltown punk lair plans to dump hundreds of rare LPs and 7-inches that recently came in on consignment, ranging from punk (natch) to psychedelic, funk, soul and “weirdo creatures of the night kind of music.” Plus, look for random markdowns around the store. 2219 Second Ave., Seattle. All three locations of the local mini chain open an hour early (9 a.m.), but the discounts come to those who sleep in. From 2 p.m. to close, all regularly priced new and used vinyl — save for reserve orders — is 10 percent off. 2930 First Ave. S., Seattle. 3715 196th St. S.W., Lynnwood. 2616 Bellevue Way N.E., Bellevue. In solidarity with early-rising vinyl hounds (though Sonic Boom opens at its regular 10 a.m. time), nearby Top Pot Doughnuts hooks up those in line with free coffee and sweet treats. Sonic Squeeze DJs Abbie (KEXP) and RightTernes (Suicide Squeeze Records) provide the soundtrack. 2209 N.W. Market St., Seattle. The Kirkland store carries limited RSD exclusives, but cuts 20 percent off “vintage vinyl” and hosts local bands (6 p.m. to midnight) like Dusty Cubby, Floral Tattoo and the exceptionally named Smuggling Croissants. 12439 116th Ave., Kirkland. Those looking to skip the crowds should peep this small, metal-and-more shop on the Hill, which plans to stock some of the hotter RSD titles in decent quantity. Come early or late, as Zion’s Gate will be open 8 a.m. to 11 p.m. Saturday. 1100 E. Pike St., Seattle. Looking to capitalize on the RSD buzz, Tacoma’s newest record shop within All Star Vintage picked an opportune time for its opening party, featuring performances from Vitamin D, Kdueskie & Truss One, Bruce Leroy and Keon Simms starting at 4 p.m. 766 S. 38th St., Tacoma.